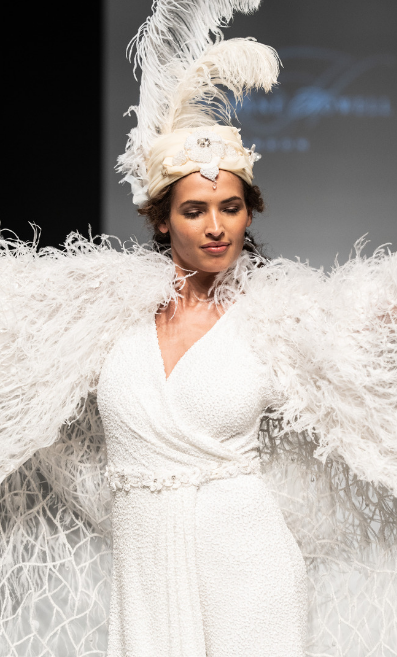 The excitement was building as London Bridal Fashion Week kicked-off in March last month, with lots of loveliness for us to find for you fabulous ladies. 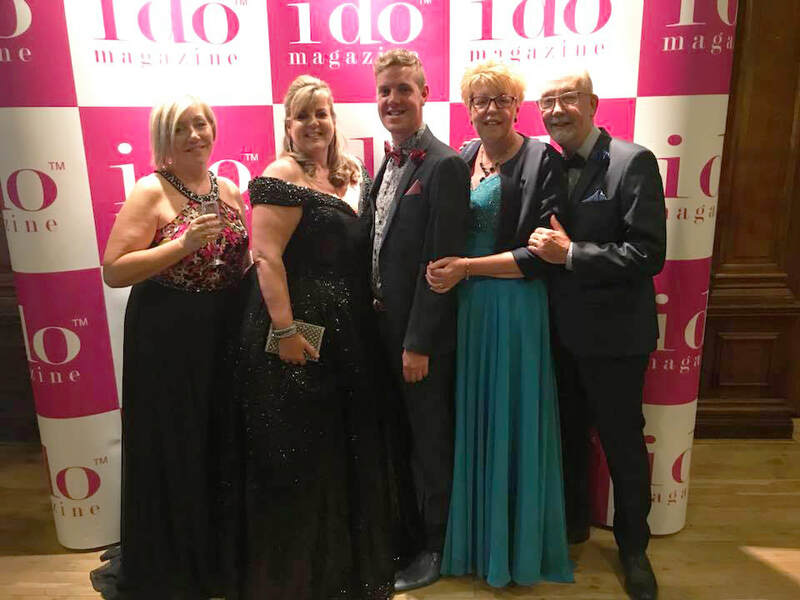 I was so excited and looking forward to seeing what our designers had for us this season from Mary's Bridal UK, White Rose, Bridal Eternity Bridal Ltd, Richard Designs, Victoria Kay and Emma Bridals and maybe to take in some new suppliers too! 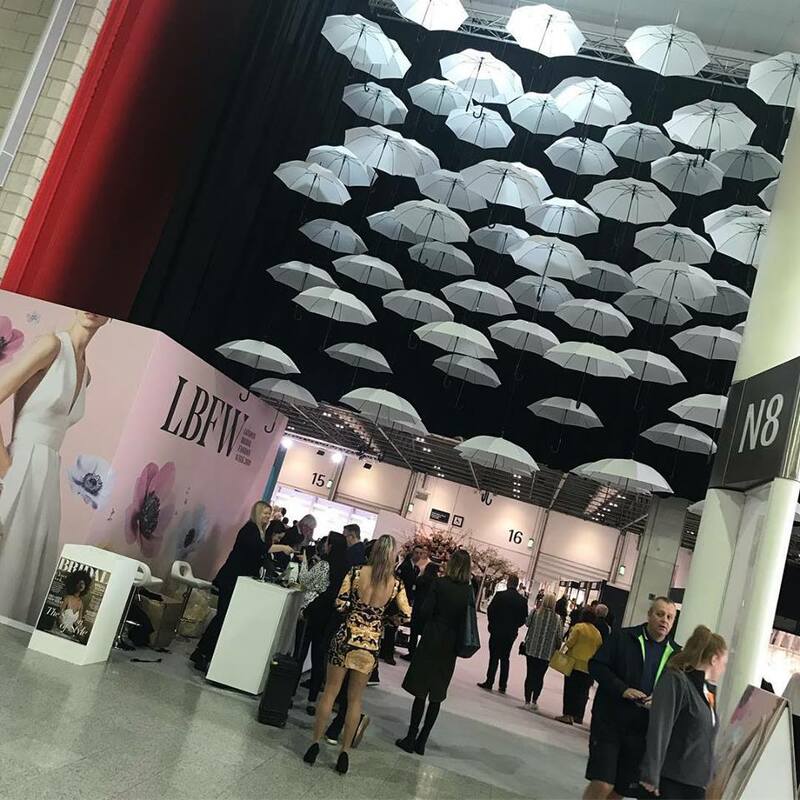 "Going far beyond the typical trade-show experience, London Bridal Fashion Week offers true value for your business through its comprehensive offering of over 250 UK and international brands, free educational programme, inspirational live fashion shows and after-hours events." We are here! Greeted by a fantastic array of white hanging parasols... What a lovely welcome. Love it!!! 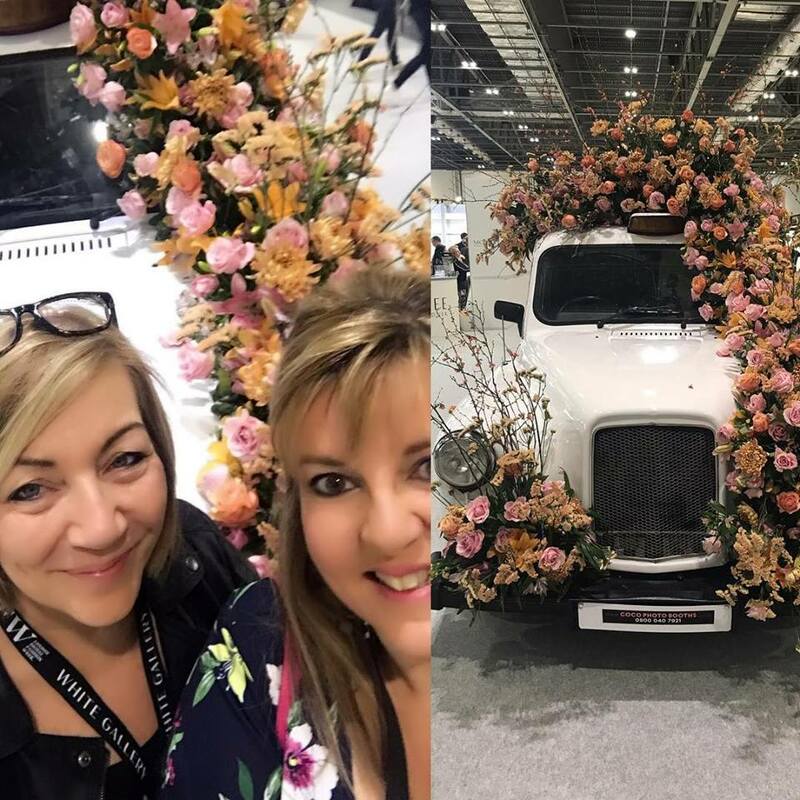 Can't resist a selfie with a beautifully decorated vehicle... A stunning floral display full of colour and surprise. 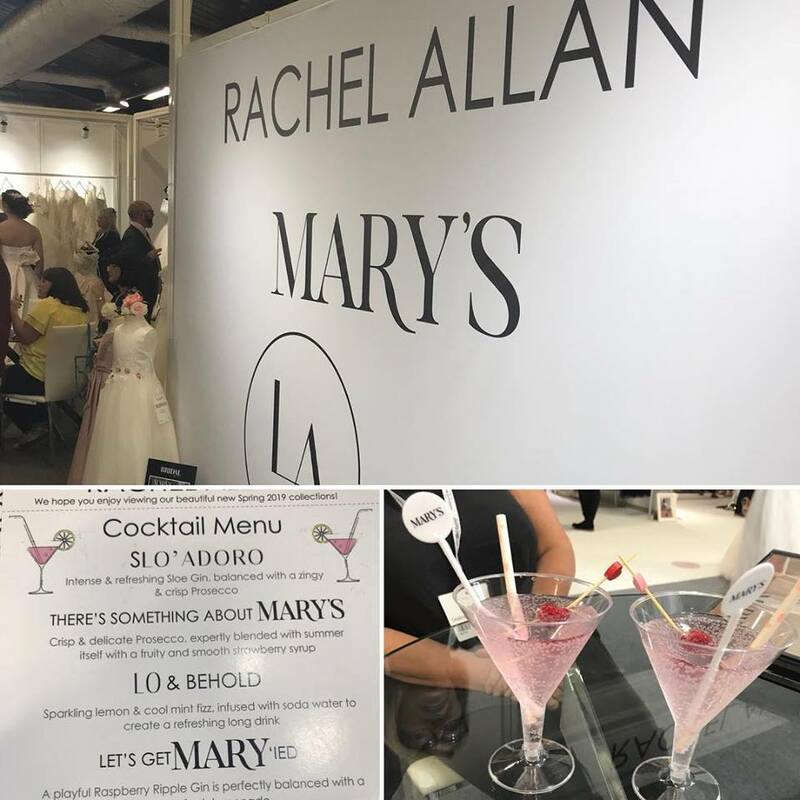 Bring on the booze... Officially getting Mary’ied with Mary's Bridal UK. Thank you for the drinks guys! WOW!!! I really have no words... Which is rare!!! 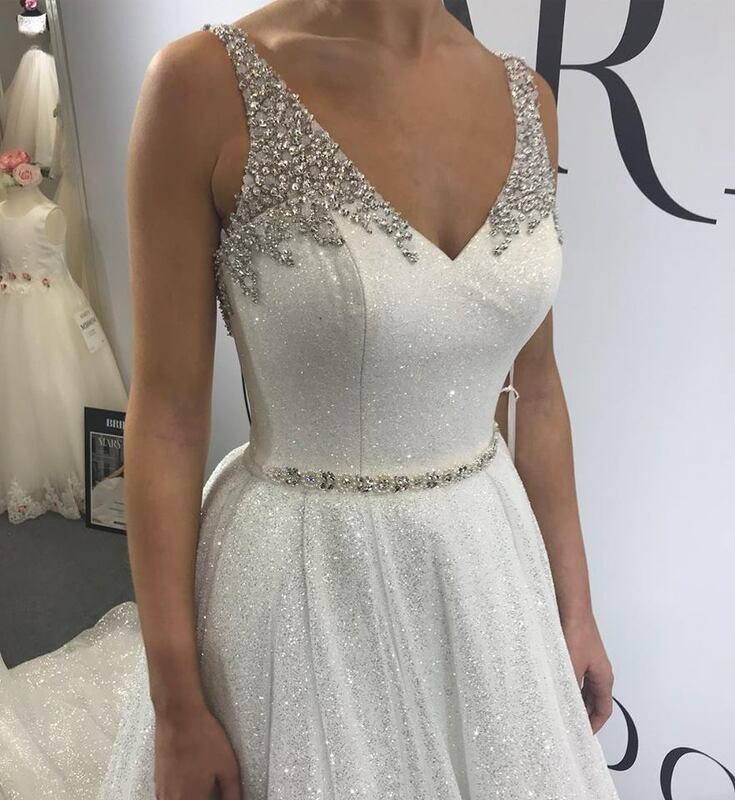 Buying this beauty for our next collection from Mary's Bridal UK. 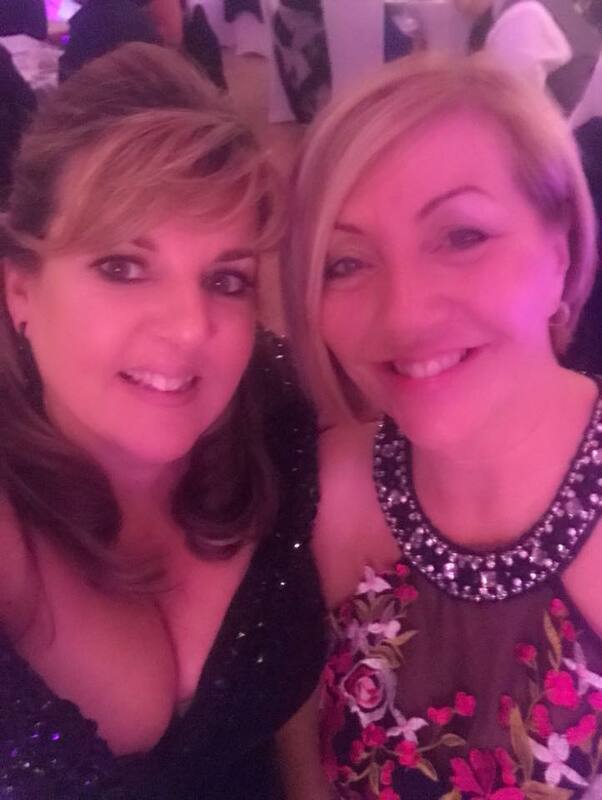 One prosecco, two prosecco... Next catwalk with the fabulous guys from Eternity Bridal. Lovely daffodils too!! When you can’t decide which one, so you buy both! 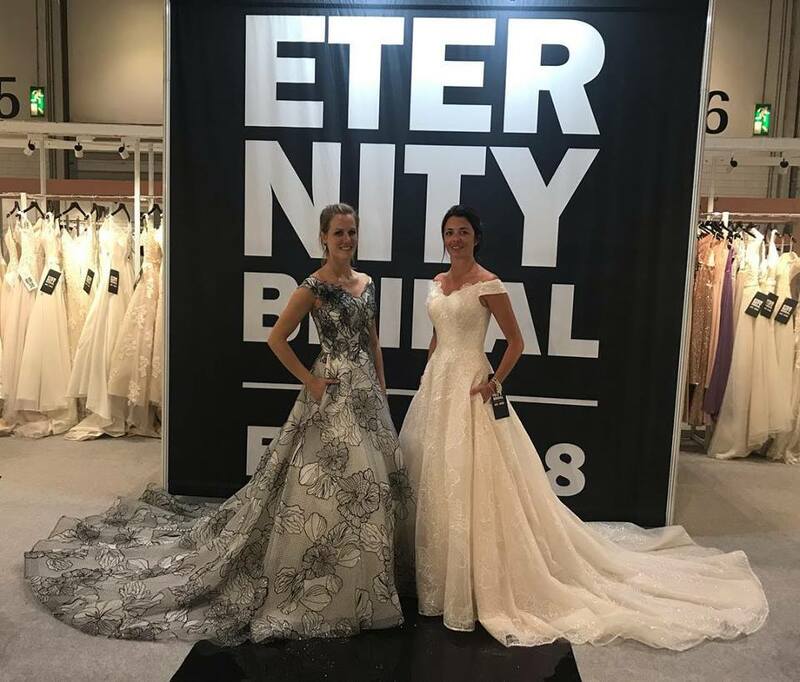 What a statement... Eternity Bridal you’ve knocked it out of the park. Another order placed with the fabulous ladies from White Rose Graceful... Love them to bits!!! Life is complete! It's only Randy Fenoli from 'Say Yes to the Dress'... Love him! "We LOVE a statement train at Mary's and this is no exception"
When you see a dress from your new next collection and just can’t wait for it to arrive!!! What shall we call her ladies? Any Ideas? 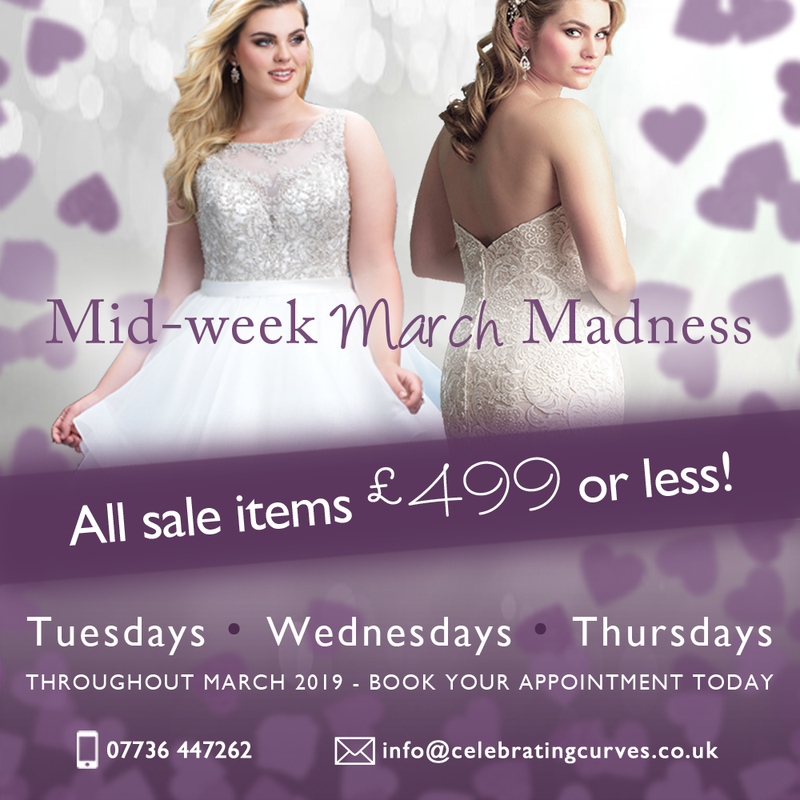 MID-WEEK MARCH MADNESS SALE - Looking for a designer wedding dress at a bargain price Ladies? Look at our March Midweek Madness promotion. Throughout March we are offering some amazing deals... all our SALE sample dresses are £499 or less! Yes that's rignt £499 or less! It's Madness! Happy New Year... 2019 is going to be a brilliant one! 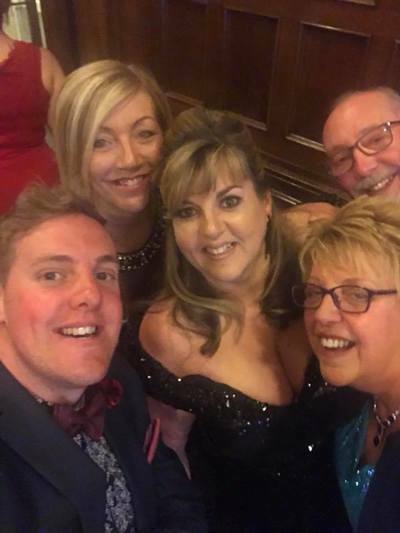 Well ladies, as the clock is ticking and we say a final goodbye to 2018 and a big hello to a bright and shiny 2019, with my very first post of the new year, I firstly wanted to take a minute to wish all of our wonderful brides (both old and new) a very Happy New Year and an amazing 2019! 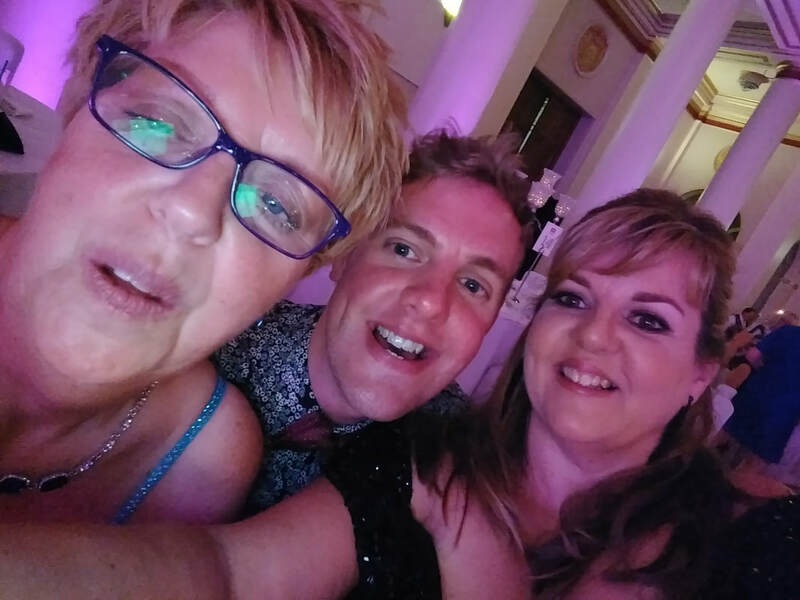 Whether you are a newly married 2018 bride, one of our original members from 2016/2017 or we are currently on your own wedding journey with you (or not quite yet) into 2019/2020, we at Celebrating Curves Bridal hope you have a fantastic and very special 2019! So, now ladies, is it’s your time to start thinking of your bridal journey... in 2019/2020? Time for lots of questions to be answered, like, 'What silhouette do you want?'. 'Do you like lace?'. 'Maybe some sparkle? ', (I mean who doesn't love a bit of sparkle). 'Ivory, White or a maybe a colour if one is feeling so bold? ', to state but a few... There are so very many choices to make, so it’s extremely important you get the correct expert advice! 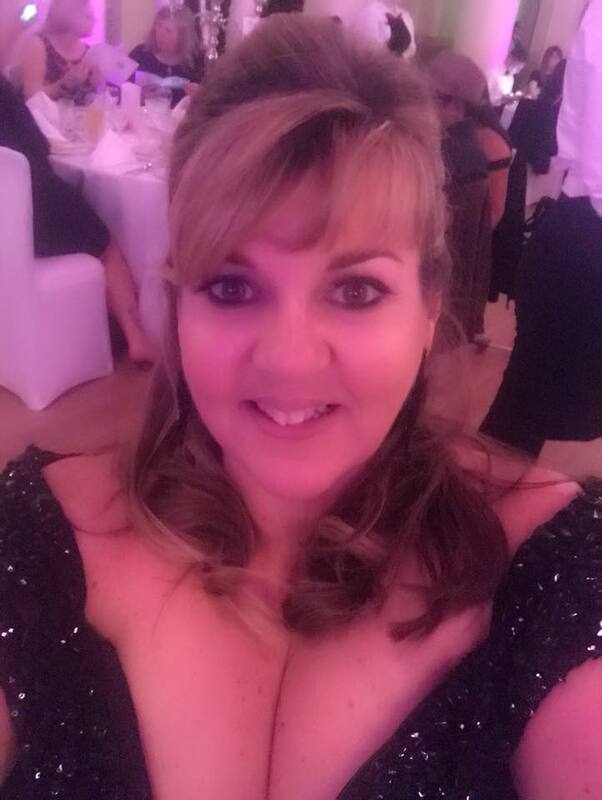 Here a Celebrating Curves Bridal, we offer flexible payment plans, a delayed measurement service and all the support you need for you, your bridesmaids, flowergirls and 'the mums' too... Oh and did I mention we also have new stock still arriving and some fabulous in-stock dresses and SALE dress to take away on the day from as little as £400!! Now really is the time to make that appointment, weekends are booking up fast, so make sure you don't get left behind... Call 07736 447262 or contact us now to secure your spot! 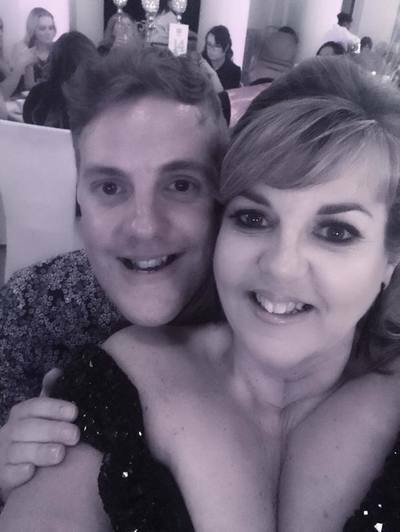 Have a wonderful, healthy and happy new year from us to you! Just had to share this with you ladies from our friends at Victoria Kay... Finding the perfect neckline to suit you on your wedding day. Illustrations by Benjamin John Ellerby at BJE art. Every woman has their own characteristic facial features and body shapes, and when it comes to choosing an outfit, it’s the neckline that is likely to make all the difference between a look that flatters your figure and face, and one that accentuates your less-than-perfect parts. 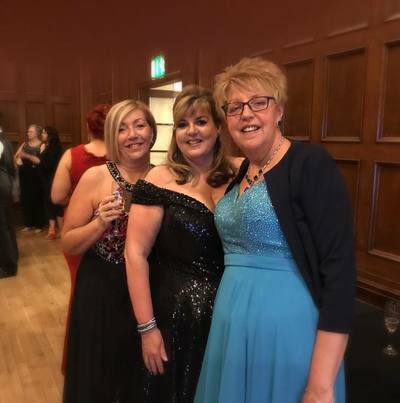 Without a doubt, when choosing the right outfit to flatter the most – to make the look appears taller, slimmer and more stylish – women are required to look for necklines that complement their body frame, wardrobe and lifestyle. Whether taking the plunge or cover up, V-neck, boat-neck, halter neck or strapless, necklines have the ability to remove pounds, as well as to give an air of sophistication and lend comfort – or do the opposite. You have to factor in your bust size, neck length, height and even face shape. 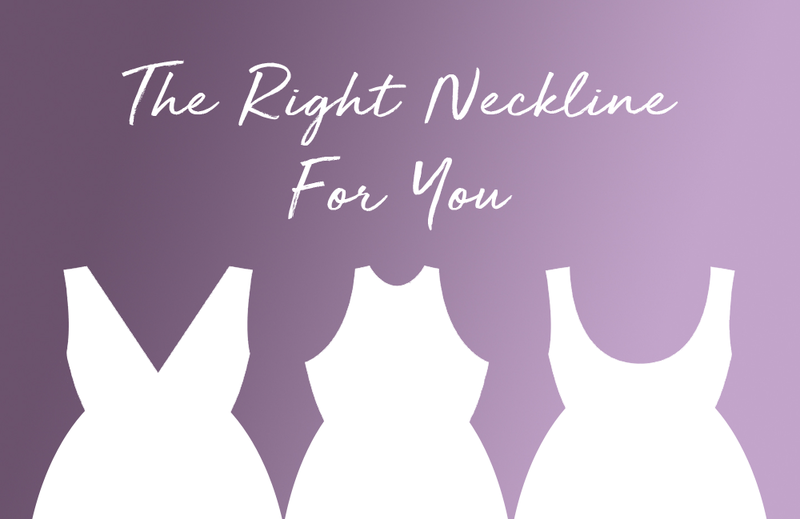 Learn some of these guides to discovering which necklines work for you, and which should be avoided by one specific frame. Because it gives vertical impression to the outfit, this type of neckline can create a leaner, longer, and taller silhouette. It’s universally flattering and popular for all figures, as it can create a balanced look, not only draws the eye upward to the face but also enhance the neck and elongate the body. Plus, there’s also versatility in a V-neck because you can lower or raise the V with a button-down shirt. Especially for those who have broad shoulders, thick torsos, or short necks, this neckline is well suggested. But overall, depending on cut of the neckline, whether you are petite, skinny, or plus size, the V-neck flatters almost every body shapes. And for those with a large bust, watch the cut. A very high V can make a large bust look saggy, while a plunging V can be too revealing, while a wide V balances out pear shapes. Also known as princess or bateau neckline, boatneck is great for offsetting wide hips since it softly follows curve of the collarbone and tends to make shoulders visually wider. Generally, these look best on women with long necks and smaller heads because the style can make both look wider. So, pay attention if you have broad shoulders because this can also make your shoulders look even broader. It enhances chest area so it’s great for ladies with small chest. These look best on hourglass figures, and because it covers the arms elegantly and comfortably, it’s also best suited for women with bulky arms. But if you have a short, thick neck or double chin, be careful with this high necked style, as it will only call attention to these areas. Because they attract attention to the centre of the body, halters are perfect for women with tall and/or broad shoulders. They cut broad shoulder lines up and also add curves. This shape is incredibly flattering, and also very flexible that can be worn well by almost any kind of body shape, particularly for those with hourglass type. However, for the busted ladies, especially if they also have bulky arms, pay more attention since this neckline also creates the impression of greater volume, making you look wider than you actually are. 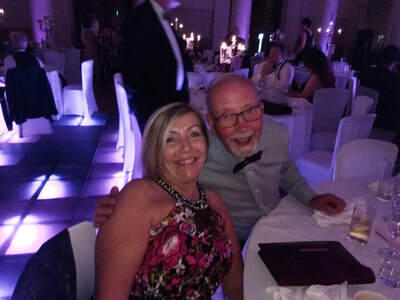 As for bustier ladies or those with broad shoulders, they can do a smaller scoop to disguise their large bust area – unless they want to show much of their cleavage. While large scoop necks create curves, a low scooped neckline can also give the illusion of a longer neck and is flattering to those carrying extra fat under the chin. However, the curvy neckline also highlights a round, full face. – Great to create an illusion of large bust. Just like its name, a sweetheart neckline forms two curves like a type of heart shape at the bust line that rise over the underarms and reach high over the breasts. Since this neckline has a shape to provide considerable coverage to the breasts, this works well in accentuating cleavage and perfect for large busted ladies. A sweetheart neckline gives a lot of room to work with since the shoulders are mostly bare – especially if it’s strapless. The best thing about this shape, it visually elongates the face and provides proportional balance to the overall silhouette. 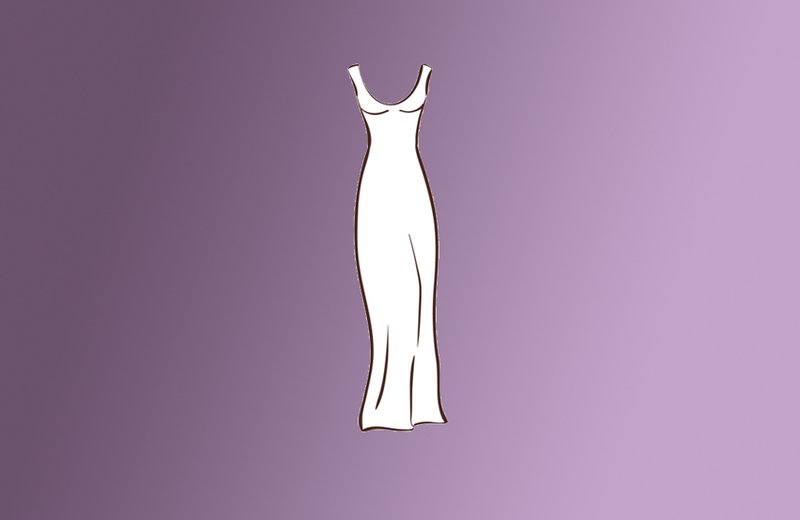 The shape is quite different from a V neck, although it may somehow appear the same to some people. It’s one of the most favourites among women and is widely used for cocktail party or special occasion. Because it shows great value around neck and arms area, a strapless top tends to be most flattering on women who have wider shoulders and a small bust-line. In some cases, this neckline doesn’t fit all body types. In fact, because it leaves shoulders and arms fully displayed, women with medium or small breasts – preferably thin – take most benefit from this look. On the other hand, if you are with curves and full chested, it’s actually fine to go bra-less as long as you know how to pull the look off with comfort, confidence and elegance. Go for seamless shaping garments or a strapless bra with great support. Stay clear of clear bra straps and uncomfortable sticky bra pads. Women with petite figure, however, can also invest in this neckline to give longer and taller silhouette. A strapless style also helps to elongate the neck. Suits for almost every body type and size, but if you are busted lady, just make sure you have good support throughout the day. Eeekkk!!! 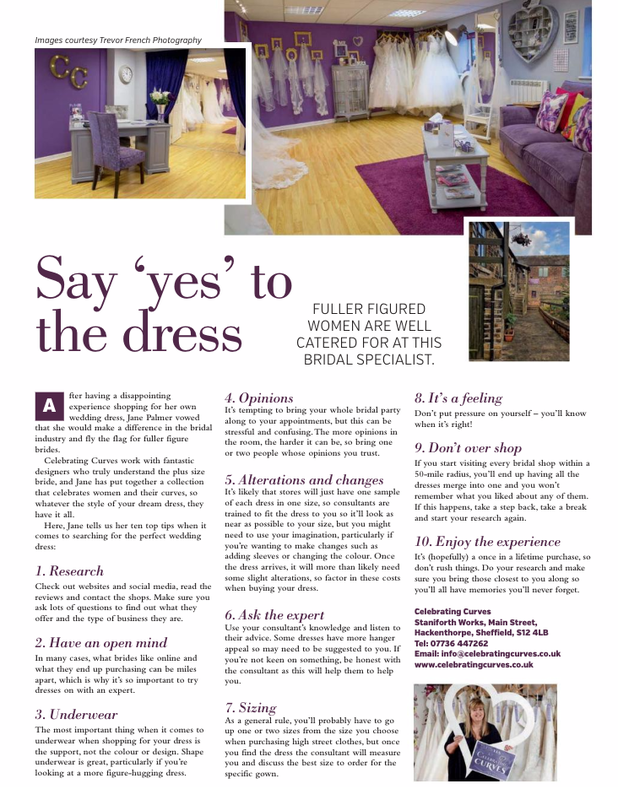 My top tips for wedding dress shopping only went and made it to print!! 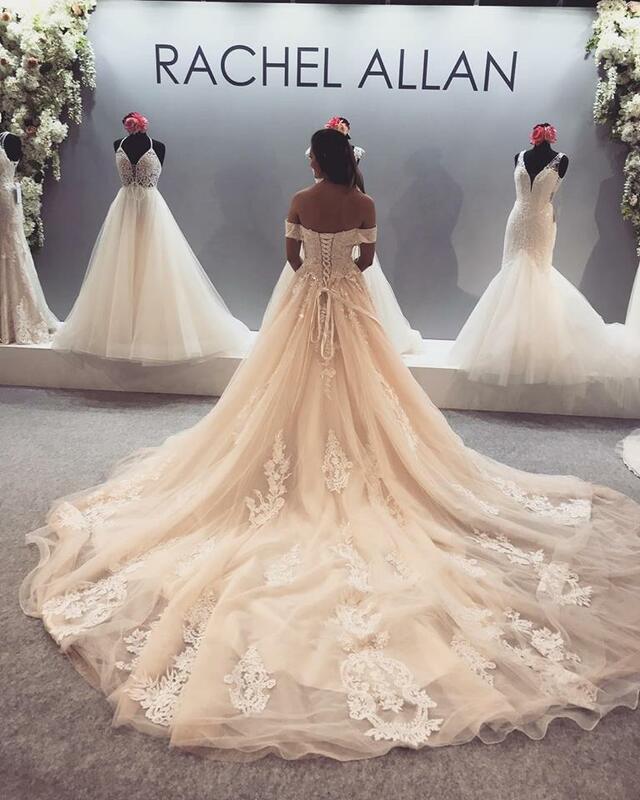 All you need to know about wedding dress shopping to make sure you find “The One”... 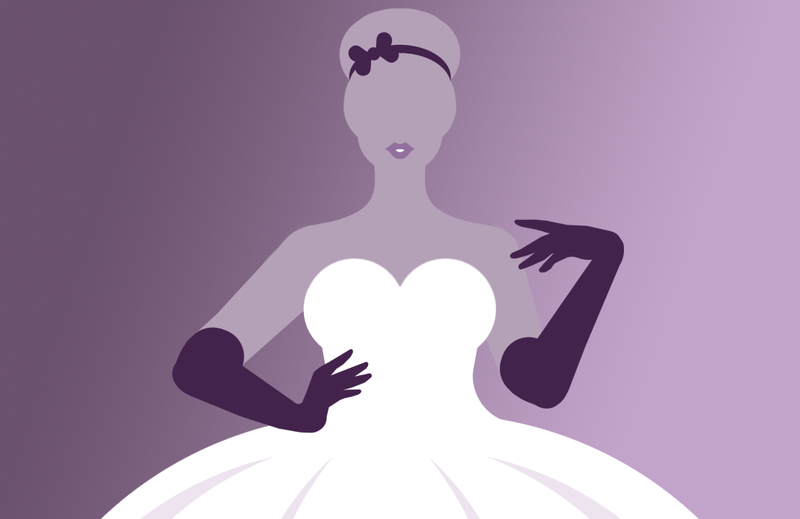 Happy reading ladies and please feel free to share with any other brides to be!! 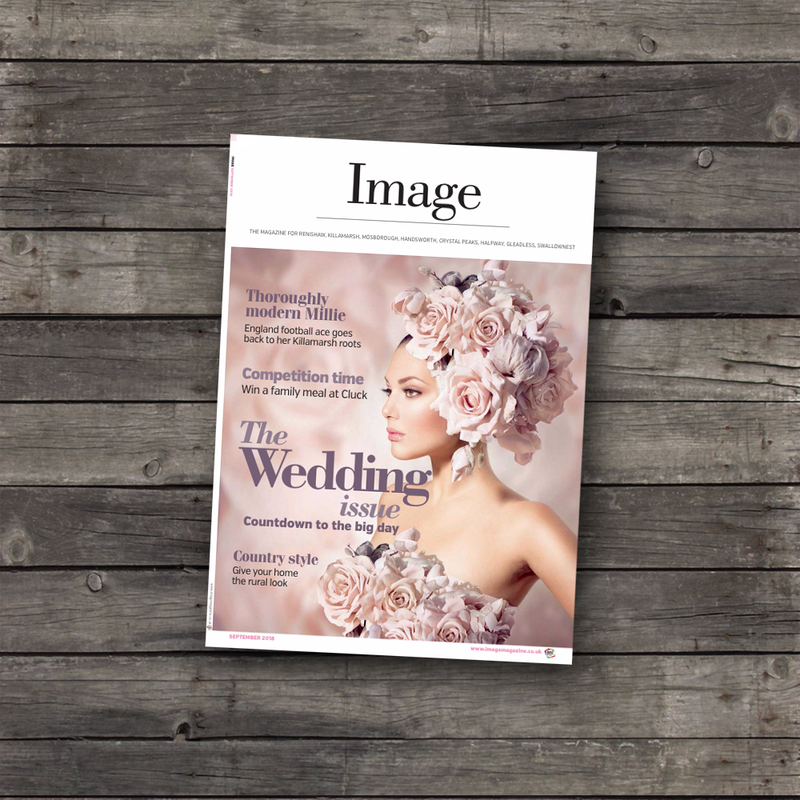 Local Image magazine, thank you so much! Well, ladies, It was finally here! That time of year, again in September... so soon, I hear you ask... Well, yes! 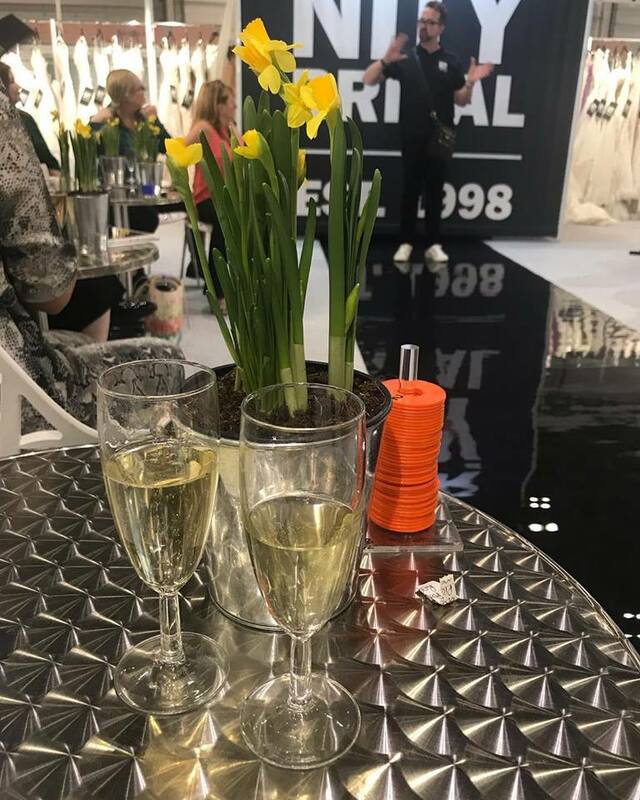 It was the one and only, brilliant, Harrogate Bridal Show 2018! And what a fantastic few days it was! 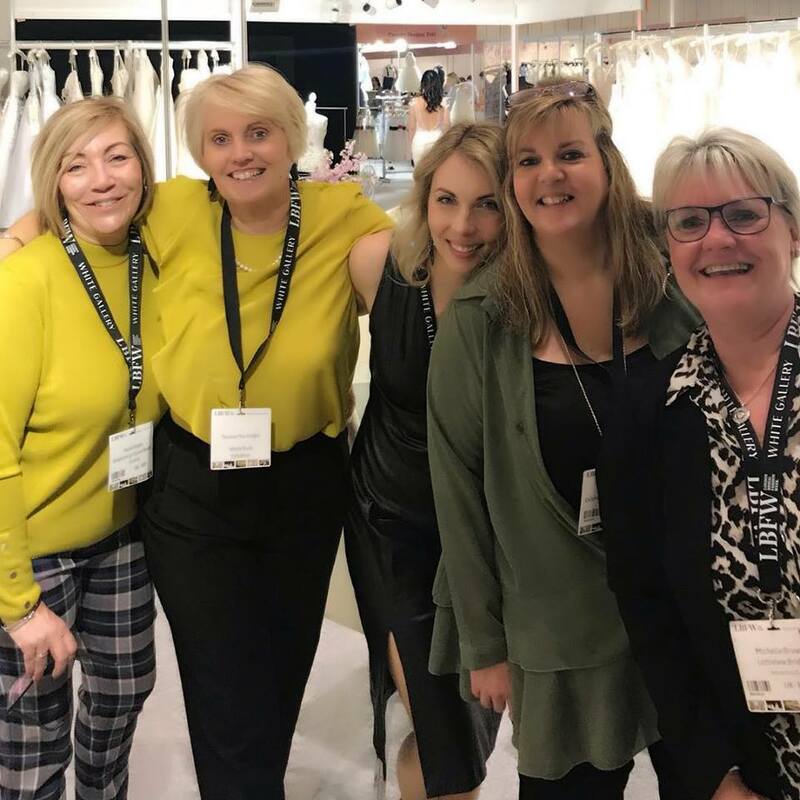 For the next few days, I was going to be choosing our 2019 collection of wedding dresses and bridal accessories in the beautiful spa town of sunny Harrogate! So, so, so excited I was! 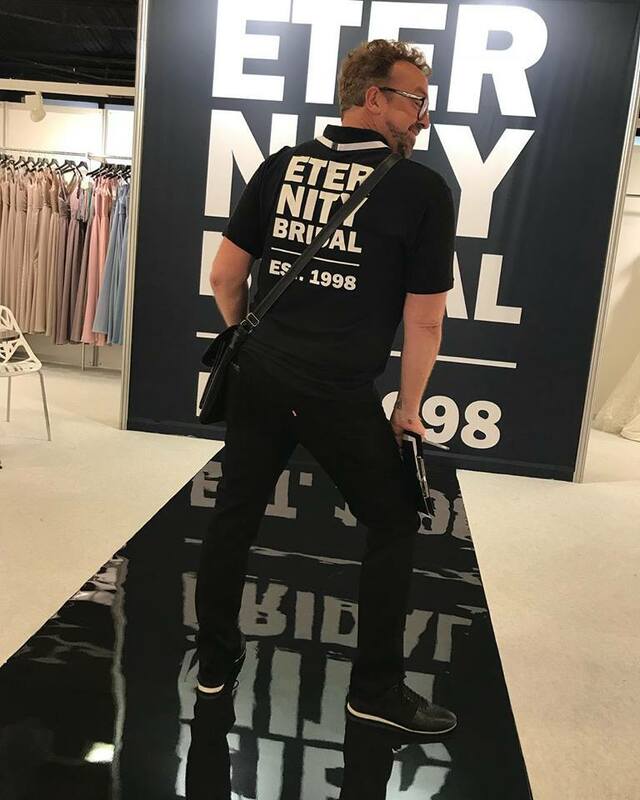 Throughout the few days, I posted a few updates via our social media pages, showing our valued followers some tempting delights and tasters of what was in store for our brand new collection... and WOW, was there were some fabulous designs on show! 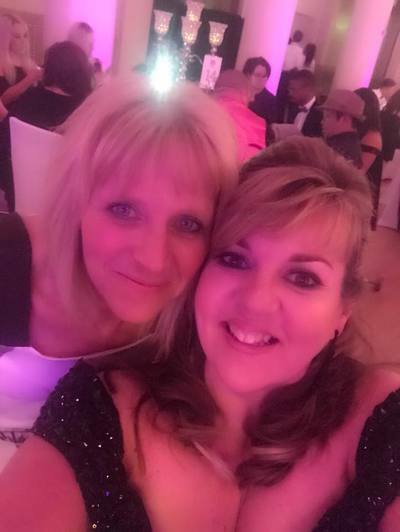 I was also so much looking forward to catching up with seeing my wonderful friends and suppliers from the best bridal boutiques and businesses from around the country and all over the world for the odd glass of champagne... or two!! Is this really my job? YES! I Feel so very lucky right now! I just love my job so much!! 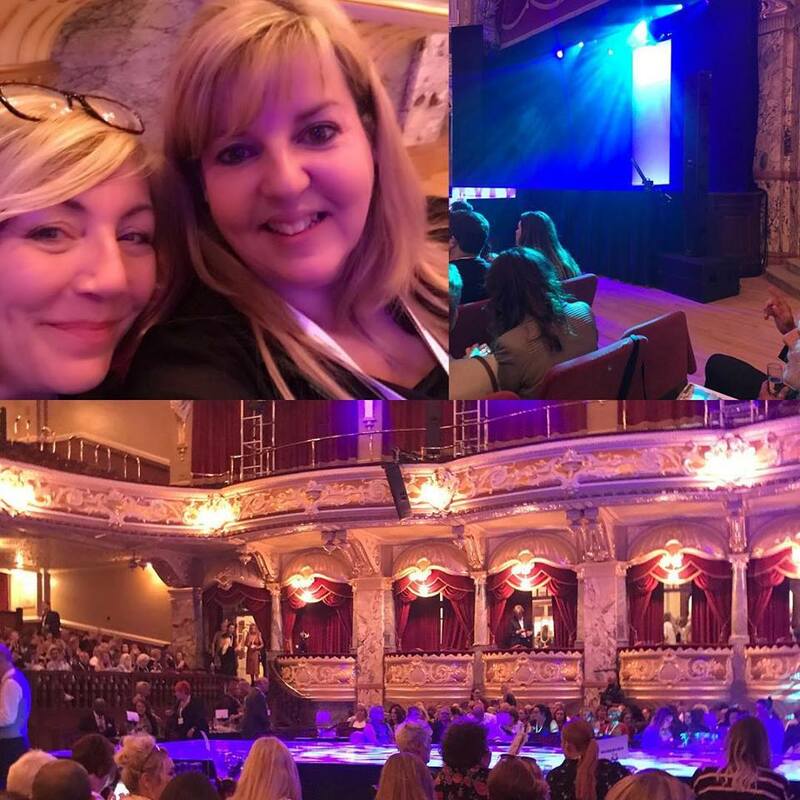 I literally could not wait to see the fabulous runway catwalk shows showcasing the stunning new collections from the fantastic designers. ABOVE: Starting as we mean to go on with the fabulous people from Eternity Bridal Ltd. ABOVE: Catwalk ready! Eeeekkk!! Cant wait!!! ABOVE: At last! Plus sized models!! So fabulous to see!!! Thank you Veromia Bridal. ABOVE: Safe to say we’ve been Mary’d!!! 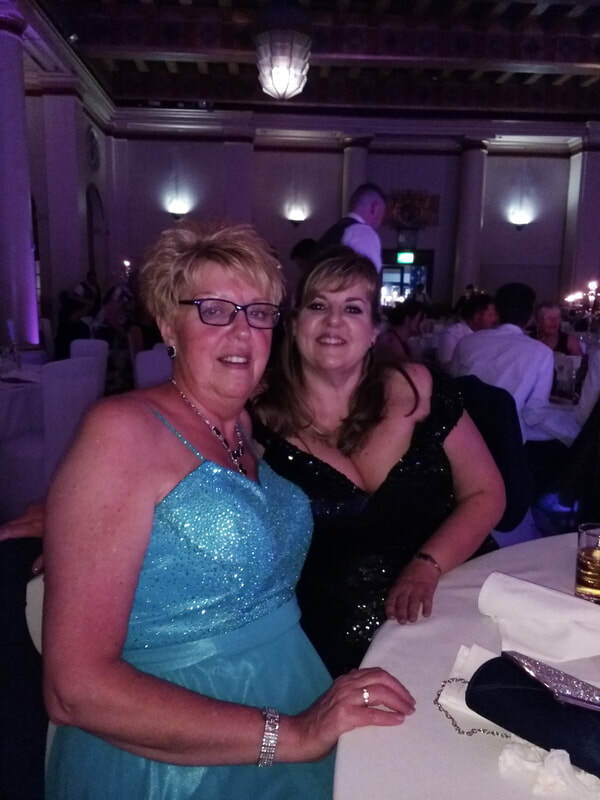 Thank you Mary's Bridal UK! ABOVE: Just going to leave this little beauty here for you to look at ladies!!! So much sparkle!!! Can't wait for this dress to arrive, from Mary's Bridal UK. ABOVE: When you sign on the dotted line for one of the world biggest bridal brands and you get to meet the designer herself on DAY ONE and she’s so, so, SO nice!! 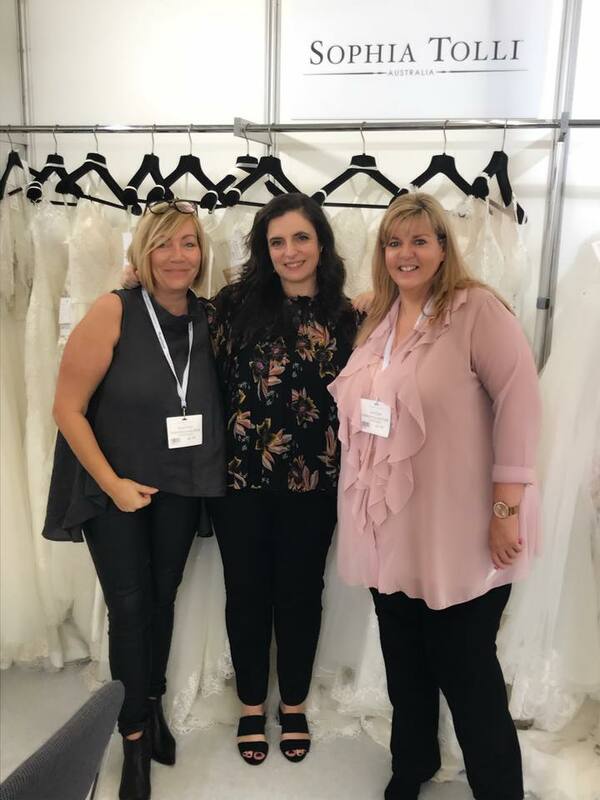 We are very excited to announce that we are now a stockist for the fabulous Sophia Tolli and have chosen the most stunning collection of dresses for our 2019/2020 brides to be!!! 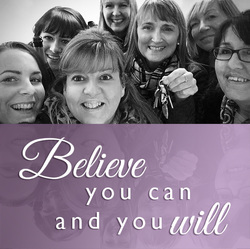 Watch this space ladies, as the order has been placed and they will arrive in January 2019!! So very excited! Well, think it's time for a rest after all this excitement ladies! Just had to share this with you ladies from our friends at Victoria Kay... Finding the perfect shape dress to suit your figure on your very special wedding day. Named after the shape the dress visually creates, this style is classic and simple. The A-line dress is fitted around the bodice and flows out to the ground. Its length can range from above the knee to full length that flows into a large train, and it can be made with everything from free-flowing silks to heavier fabrics such as satin. The princess cut version of the A-line dress is more dramatic and emphasizes this style’s clean lines by utilizing vertical panels that run from the neckline to the hem. 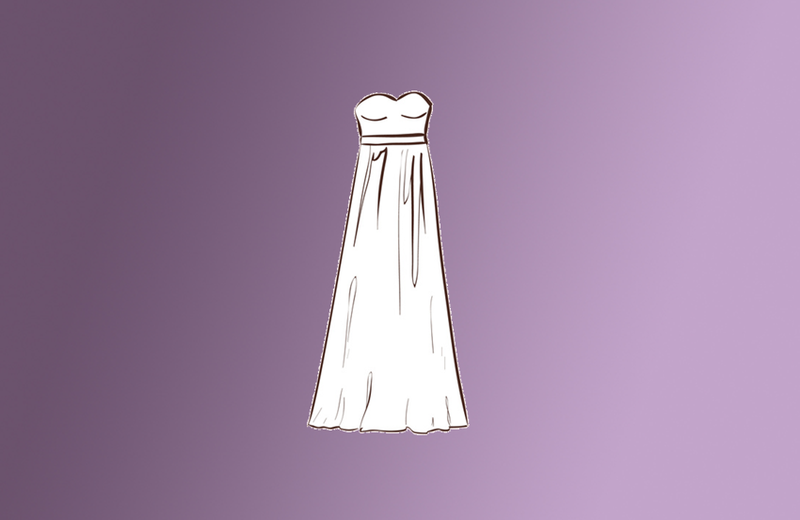 Who It Flatters: The A-line dress is a good general option for almost any bride. The full skirt of the A-line can hide a rounder lower body or create the illusion of curves on a narrow frame. 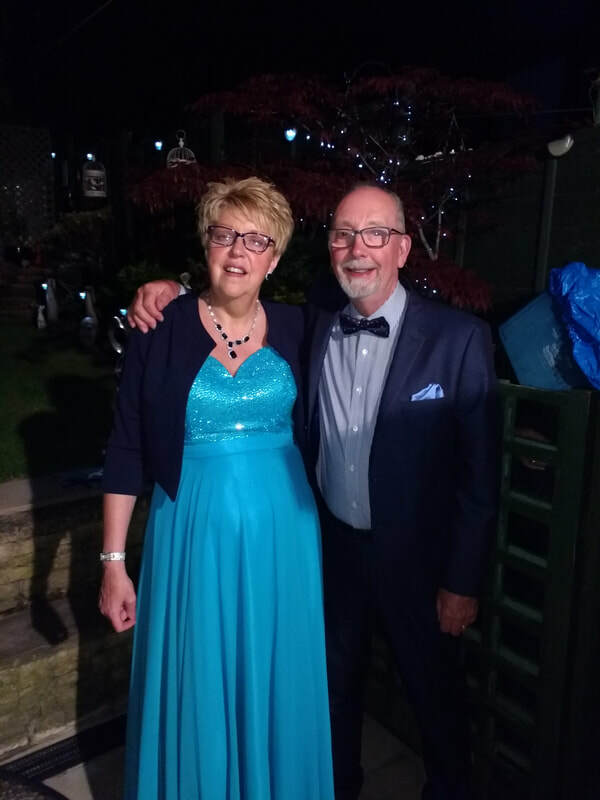 If your main goal is to slim, the princess style is a great option that elongates lines creating a slimming effect as the eye naturally focuses on the length of the dress. As you can probably guess from its name, the column dress has a narrow shape that flows straight down from the top to the bottom. This dress, also referred to as a sheath, tends to hug the body and show any and all of your curves. A column dress can be a simple slip dress to a more contoured dress made of heavier fabrics such as damask. 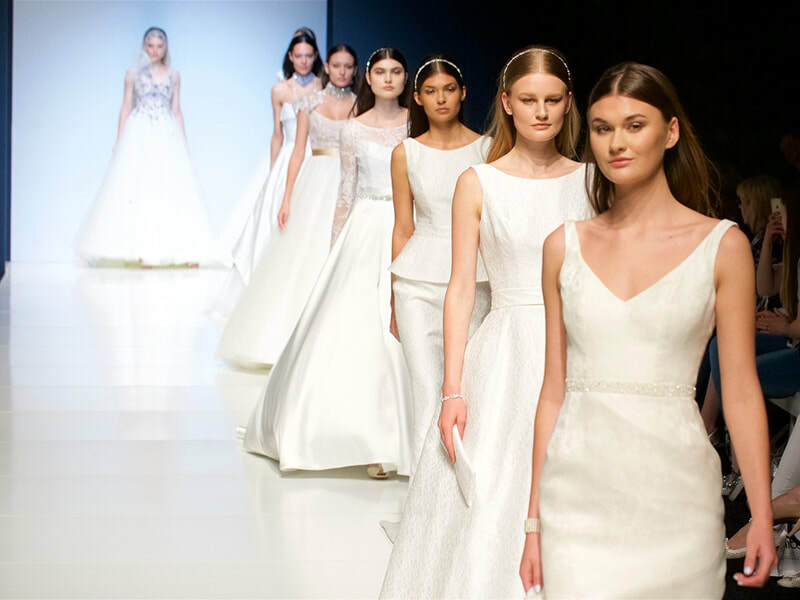 Who It Flatters: Although a column dress style is timeless, it’s typically not as forgiving as other styles and is best suited for lean brides. 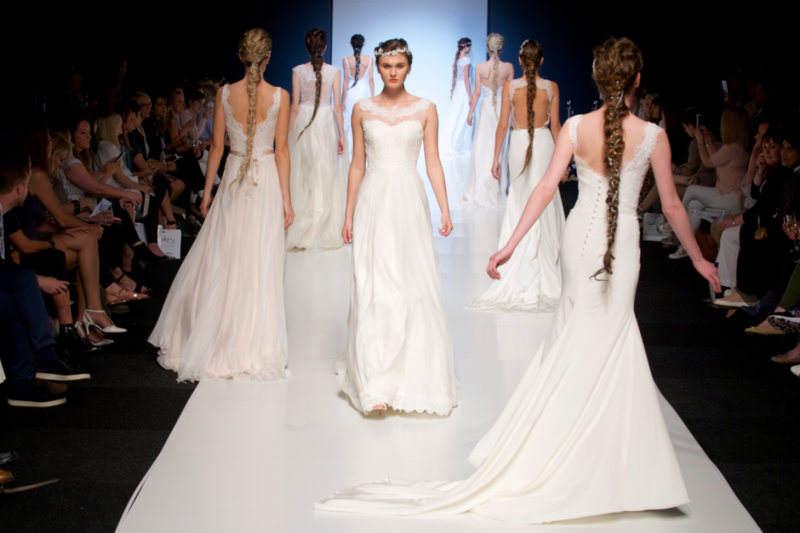 Petite brides can look taller and longer in a column dress, but there’s not much room for hiding problem areas. Also beware that some column dresses are very tight and may restrict movement on the dance floor! The empire dress is unique for its raised waistline that sits just below the bust, from which the rest of the dress flows down. Empire dresses can have varying sleeve lengths ranging from longer bell sleeves to sleeveless, along with different skirt cuts that can flow freely or contour to your body. Additionally, empire dresses are usually made from lighter fabrics, so this style of dress takes on a romantic feel. Who It Flatters: An empire dress works well on most body types but is specifically flattering for a bride looking to enhance her bust. On the flip side, ladies with large busts also like empire dresses because the traditional square can better cover larger breasts. This dress is also ideal for pear-shaped figures, as it is forgiving of the legs and hips. Because of the room in the stomach area, this is also an ideal dress for pregnant brides. 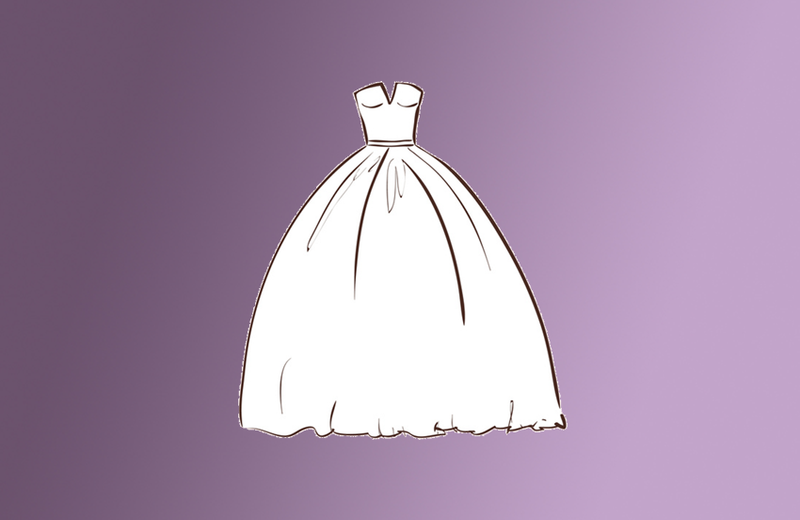 Princess also known as 'The Ballgown' This is the style of dress that fairy tales are made of. With a fitted bodice and full skirt that can either be one piece or separate, this dress is perfect for big, traditional weddings. You can even pair a princess gown with long gloves and a dramatic train for even more of a “wow” factor. Everything from satin to chiffon is used on top, along with layers of taffeta or tulle on the bottom to create a floating effect. 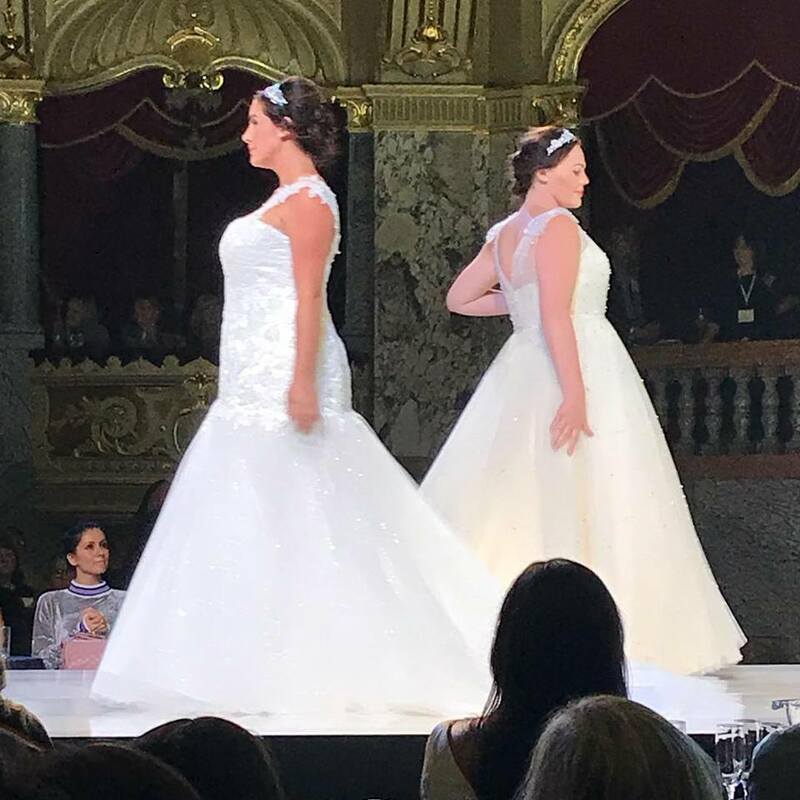 Who It Flatters: While many brides will look beautiful in a princess gown, the cut is ideal for slender or pear-shaped figures as the full skirt helps to accentuate the waist and hide the lower body. Additionally, this style helps create the hourglass look because it emphasizes the waistline. If you’re shorter, beware that a skirt of this size can overpower a small frame. Fit and flare is a very figure hugging cut that highlights a woman’s curves. Its silhouette contours to the body from the chest to the knee, and then flares out to the hem. This dress style comes in various versions from strapless, to halter, or trumpet flare and even flamenco—so the sky is the limit. 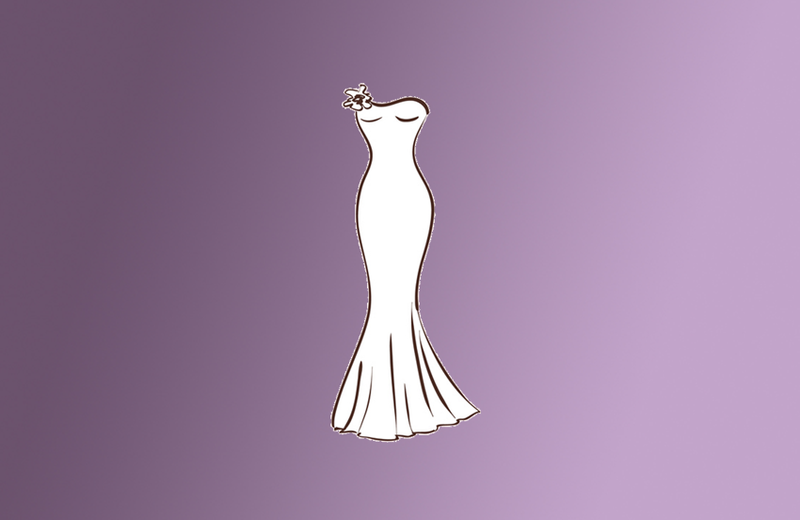 Who It Flatters: Because of its body-hugging cut, the mermaid is best worn by brides who are confident and comfortable in their skin. It is flattering on slender, short and tall figures, however, girls who love their curves can rock this dress as well. Now that you know all about the different styles of wedding gowns, what about the sizing? Sizing can be a bit tricky as pretty much every wedding dress manufacturer has its own sizing chart. If you find a dress you’re in love with, the first step to finding your perfect fit is to be properly measured with a vinyl measuring tape (cloth tapes can stretch) by a tailor at your bridal store. 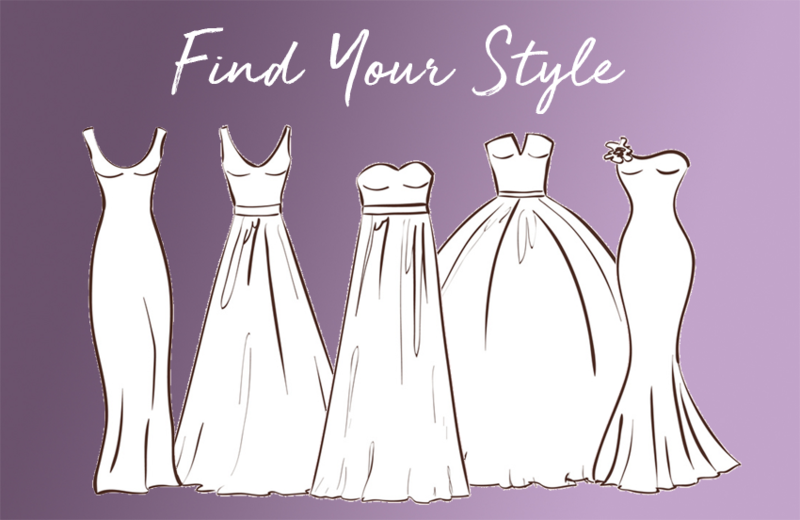 Once your measurements have been taken, check them against the wedding dress manufacturer’s sizing chart to choose the dress that matches your largest measurements (usually if your dress shop is ordering for you, they’ll take care of this step). 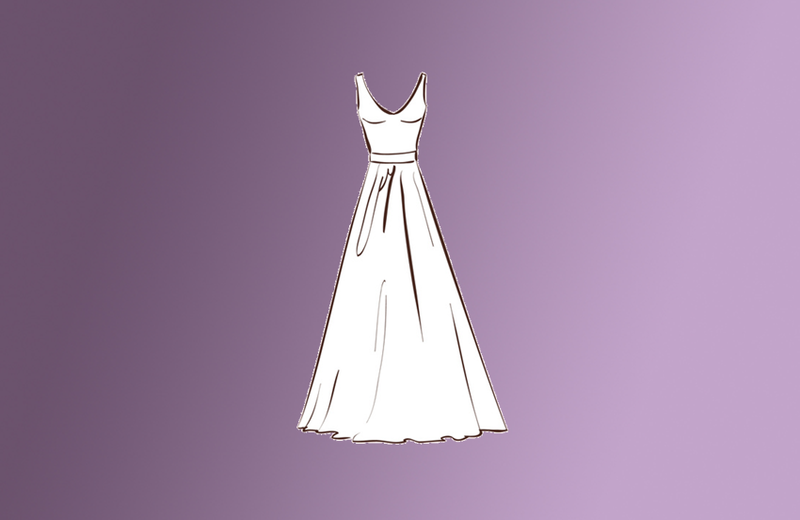 Don’t be alarmed if your wedding dress size is different than your everyday non-wedding attire. It is quite common for dress sizes to be at least one or two sizes larger than the size you’re used to wearing. 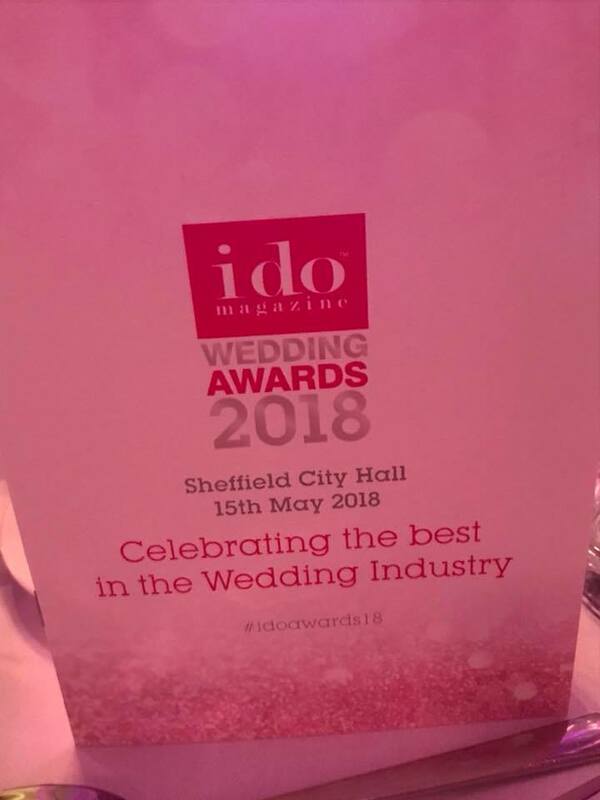 Well, ladies, if you didn't know already, Celebrating Curves Bridal became a Finalist, yes a FINALIST yet again, but this time in the nominations for the 'I Do Magazine Wedding Awards 2018'. Eeek!!! 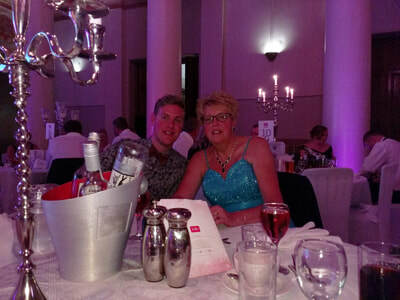 The 15th May was the night of the awards, held at the City Hall in Sheffield. I could not believe that we were finalists in the Best Bridalwear category for Yorkshire, we are all SO excited!! So on Tuesday night in true glamorous style, my four fabulous friends and I - who have helped me SO much over the last two years and who I truly adore and I couldn’t do it without them, Helen, Benjamin, Dianne and Stephen. Love them all to bits!!! We are here!!! #teamcurves ready for the full night ahead!! 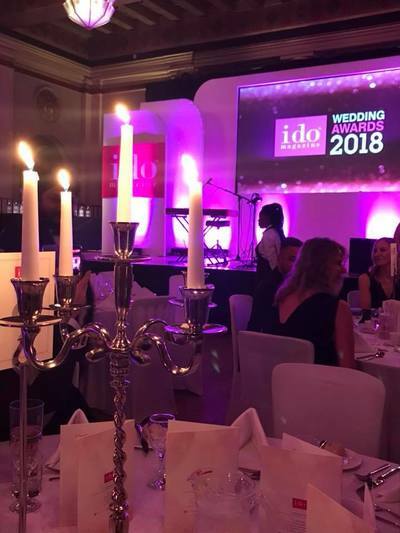 @ido_magazineuk Wedding Awards 2018!!! Well, unfortunately, we didn't win, as we were up against some top respected bridal shops in Yorkshire… But a very good night was had by all!! To be honest it was fantastic just to be nominated. Oh well..... here’s our sad face - we didn’t win, but what a great night!!! 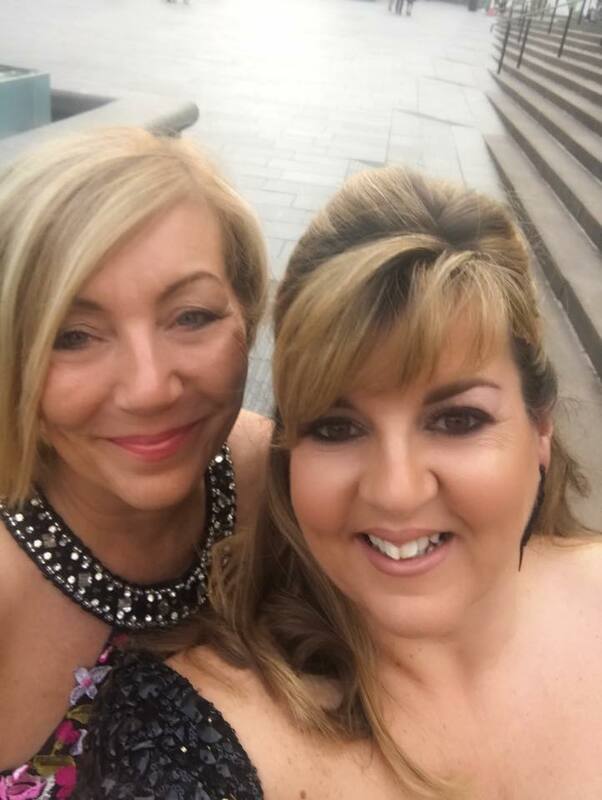 We totally understand that shopping for the most important dress of your life can be a nerve-racking and sometimes stressful experience as well as amazingly exciting. So to help settle some of those nerves, we’ve put together this little video slide show, so you know exactly what to expect when you visit us for your appointment. We looking forward to meeting you! If you’ve not booked your 2-hour private appointment yet, contact us now..... it will be fun, we promise! !